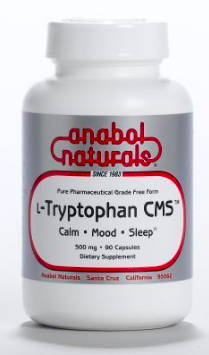 AnabolNaturals’ Pharmaceutical Grade L-Tryptophan CMS provides the absolute purest quality free form L-Tryptophan, used worldwide by medical and holisitic practitioners. Excessive degradation of L-Tryptophan from food sources by the body in the digestive process or by aging can preclude adequate production of serotonin in the brain. This in turn can result in poor sleep quality, stress, emotionalism (mood swings), weight gain and a loss of the feeling of well being. L-Tryptophan is a precursor to serotonin and is powerfully effective. Directions: As a dietary supplement, take 1 to 4 capsules daily between meals.